I used to all the time. Now it’s 50/50. You know, I try not to, but sometimes you should. So sometimes I do. From time to time….But it’s very capricious. On subways. It’s not like a rule or anything: only subways. It’s just I’m always very distracted on the street. Yes, unless they are clearly high or wasted. Only when my kids (ages 7 and 4) are with me. Sometimes — it’s on a case by case basis, but I always give my leftovers away. musicians on the 3 train. Yes. I give money, food, to whoever. Musicians and street performers almost always. Panhandlers sometimes. Depends — it’s case by case. When they play instruments. Not like, every time I see a musician I’ll give them money, but usually if I give to panhandlers it’ll be if they’re playing an instrument. Yes, and all buskers on principle. Yes, but I often feel I choose the wrong ones. Occasionally, but never to those in expensive down jackets, new boots, and designer jeans. Yesss, I cant help it. I always feel deep inside that one day that could be me. I do, not all the time, but I do. I choose to share food, water, and a smile. I give them money if I find them entertaining and not annoying. I do. Who doesn’t need a little help now and then? This is, obviously, only a cross section of New Yorkers who range from well-off to rich. Still, I draw two conclusions from this. First, panhandlers would all have houses in the suburbs and buskers would all be millionaires if everyone here were telling the truth. 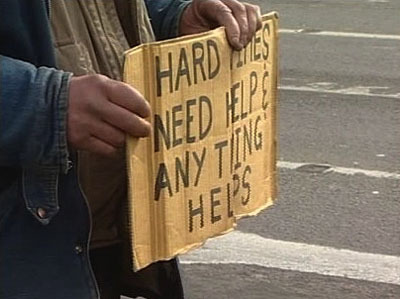 Second, nobody is willing to just flat-out admit in a public forum that they don’t give money to panhandlers. Marla Maples (“I choose to share food, water, and a smile”) and Randy Cohen (“I try not to”) come the closest. Discuss.